Questioning whether one can actually speak of an “outside” or “inside” when it comes to Internet traffic, we at SRF Data wanted to explain the reader if it is theoretically possible to be surveilled when browsing a Swiss website (even one physically hosted in Switzerland). 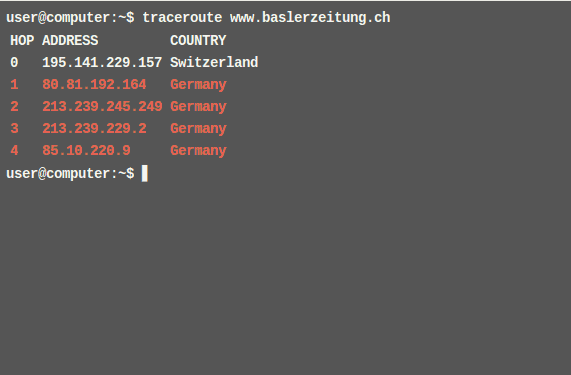 Turns out that the large majority of requests to the top 180 Swiss websites “leave” Switzerland and are routed over Germany or France or even the US – and are thus subject to surveillance. In order to visualize this, we rebuilt a terminal that allows the reader to fire up a “traceroute” requests (nerds galore yay! ).